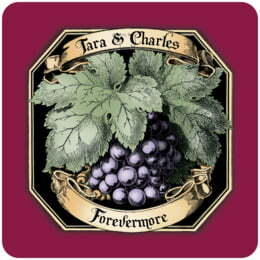 The centerpiece of this design is an antique lithographed grape cluster with leaves and tendrils. 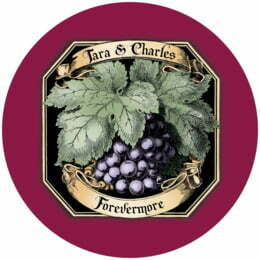 This style is designed especially for red wines such as pinot noir, merlot, chianti, cabernet, shiraz, and others. The lithograph is outlined and shaded with black hand-inked lines and is filled in with soft watercolor shades of purples, greens and brown, with a rich, deep, wine red background. The leaves and grapes drape over the banner, in places in front and in other places behind it. The main banner contains the featured text, which is typographically styled by our professional designers to balance your words beautifully. The main font is a flamboyant, bold, old-world blackletter font. Everything about Meritage Red is ornate, with much visual movement. It has a patina of antiquity displaying both elegance and style. Its sister style, Meritage White, has white grapes and is made for white wines. Customize your Meritage Red wine labels today for your next event or party, and partner it with Meritage White wine labels for elegant table decorations and treasured memories. Customize your Meritage Red coasters today! Meritage Red coasters are made of extra-thick 58-point board. To give you an idea of how thick they are, a stack of a dozen coasters is about 3/4" tall. They are made of absorbent pulpboard to help protect your tabletop. The coaster surface has a smooth matte coating to provide beautiful, crisp printing. Each coaster is carefully die-cut in a letterpress, which gives the top edge its distinctive rounded shoulder. We use a digital 4-color, high-resolution press for fine detail and rich color. All of our personalized coasters are designed to match our labels, tags, and other products, so when you order multiple items, you get a matched set. On the back of each coaster, a small Evermine logo is debossed (pressed into the paper).